Mr. L. lives in a modern building with walls made out of glass. Mr. L. seems very hospitable, because the front door is always open! And because Mr. L. often receives guests, a hostess is waiting at the door. She informs us that the host is still indisposed. The lobby features a huge bar and the hostess offers a drink while waiting. It doesn't take long until it becomes obvious that the owner of this estate loves cars. It starts with subtle hints. The patterns behind the glass walls match those of the grille of a Lexus. And the flowing lines above the bar are like the front of a Lexus. Coincidence? And the couch... it is upholstered with the same leather as the seats of a Lexus! The wall along the stairs to the first landing is decorated with car parts painted in white (see panoramic photo) which are obviously from Lexus models. There's no doubt about it: the "L" in "Mr. L." is for "Lexus". And this place isn't a house, but "Intersect by Lexus". "Intersect by Lexus" isn't a garage, a showroom, a dealership or even a museum. No cars are being sold here. There is no car salesman and there are no car brochures here. Instead "Intersect by Lexus" is a restaurant that embraces the guests with the same luxury as a Lexus car. It does so by offering the same decoration. By using the same style, materials and patterns as in the Lexus cars, this restaurant oozes the same exclusive atmosphere. There's just one vehicle in this two-storey building. Every few months the car on display is replaced. Most of the time "Intersect by Lexus" shows concept cars, but today Lexus' latest racing car is in the spotlights. 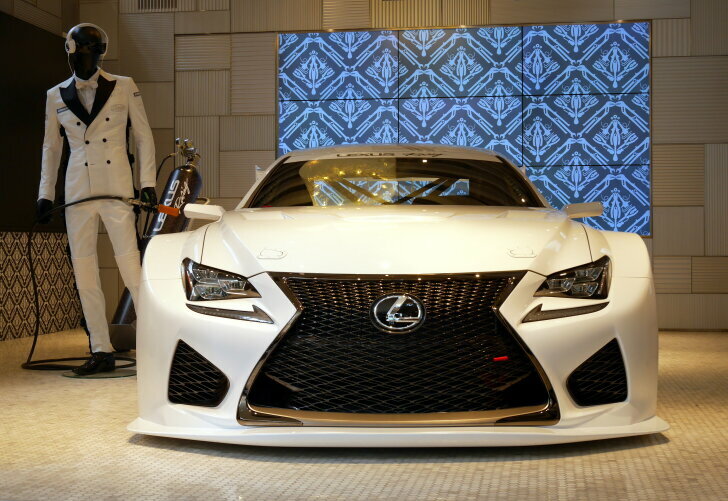 The "RC F GT3" was revealed a few months ago at the Geneva Motorshow and is now on display in Tokyo. In 2015 this 540 PS strong version of the "RC F" will compete in races both in Japan and Europe. Lexus has recently started competing in motor sports and does so to work on its image. That's because Lexus started out on the American market. It was only later that Lexus conquered Europe. In it's home country, Japan, Lexus is relatively unknown. While "Intersect by Lexus" emphasises on the elegant qualities of Lexus, competing in motor sports should prove its dynamic qualities. 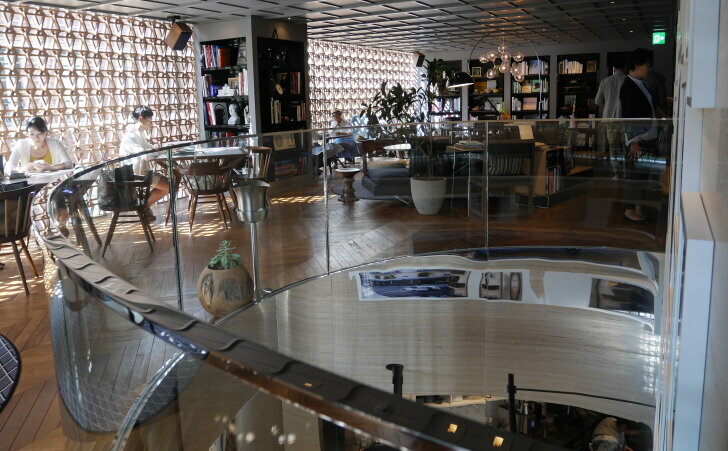 The restaurant on the top floor feels more like an intimate living room than a place to eat. The artswork decorating the space has been created by young Japanese artists and there are books about travelling, photography and architecture scattered around the room. The meals have been "designed" by the well-known Japanese chef Daichi Tajima and are being prepared at "Intersect by Lexus" by hand-picked cooks. When it comes to food, standards are already sky high in Tokyo, yet "Intersect by Lexus" raises the bar once more! Many vistors aren't even aware that they are eating in a restaurant owned by a carmaker. They simply choose this place because of its looks and the quality of the food. It is only later that they realise they have experienced the "Lexus feeling"; and that's exactly how Lexus wants it to be. Those who want to try it for themselves are welcome. 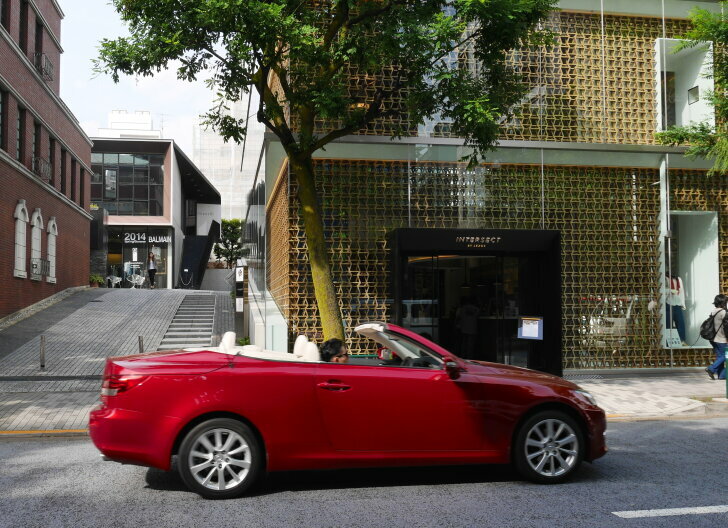 "Intersect by Lexus" is opened daily from 11 am to 23 pm (reservations not required but advised). A word of advice: do visit the toilet, even if nature doesn't call. This restroom is decorated with toy cars making it the prettiest in all of Tokyo! Buying a car seems like a simple process. The customer reads reviews on the Internet, test drives one or more vehicles and purchases one. As far as Lexus is concerned there's one more step. The first step should be: experience the feeling that comes with a brand. And that's what "Intersect by Lexus" does: without the pressure of sales people or test drives one can enjoy the Lexus experience. In a restaurant that breathes the same quality and exclusivity as the Lexus cars, the guests can literally get a taste of Lexus. As far as Autozine is concerned Lexus succeeded in this setup. "Intersect by Lexus" has grown into a very popular place in Tokyo; that's why "Intersect by Lexus" will soon expand to Dubai and New York.